The image above may look like a gardening project gone wrong, or a lot of effort to set up a unique photograph. However, neither of these options can explain the image. Art can take on many forms and serve many purposes. The photograph above showcases the collaboration of art and nature. It serves as a medium for discussing the importance of growing awareness for both nature and art in urban areas. This photograph is just a tiny piece of a larger project. The French village of Jaujae celebrated the 10th year of its Arts and Nature Trail program by spreading 1,400 feet of living turf throughout the community. In this urban city there is little room for art or nature. This extensive stretch of turf weaves its way throughout the city; up stairs, around corners and down streets calling one and all to experience both nature and art. The 3.5 tons of natural, living turf grass is meant to bring both art and nature into an urban area that would otherwise be overwhelmed by its stone structures. The goal is to provide urban dwellers with a link to all things artistic and shine light on the beauty of the natural world. This winding band of grass serves as a connection for the individuals of Jaujae with the place where art and nature meet. This endeavor forces individuals to take a moment away from their everyday activities and appreciate that which is creative. It urges the public to support both the arts and projects that bring the natural world into the city. This creative, artistic idea definitely calls for attention and support in a way that a simple garden never could. It literally attempts to use art to connect man with the environment. 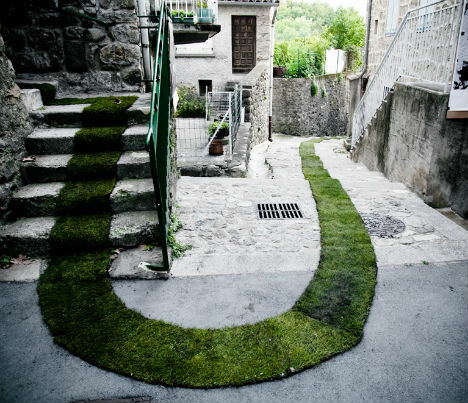 The grass path that runs throughout the city is only a temporary installation. However, it will be interesting to see how this artistic effort works to inspire not only the people of Jaujae, but also others who wish to discover artistic ways of bringing communities together through nature. This entry was posted in 3-d sidewalk art, Art Appreciation, Earth, France, great images, Landscape, outdoors, paint by number, pavement art, photographs, Segmation, Sidewalk art and tagged Art, artistic, city, grass, jaujae, Lawn, natural, nature, Photograph, Trail, urban, Urban area on May 13, 2012 by segmation.